Torque is transmitted by a magnetic field without friction or wear: Eliminates mechanical contact and shock loading to the prime mover. Providing loger life. For more than three decades now in the industry, we have become amongst the renowned manufacturer and supplier of top quality range of Eddy Current Dynamometers. he dynamometer would be capable of absorbing & measuring power in both directions of rotations (bi directional), in accordance with its Power and Torque characteristic curves enclosed herewith. Powermag Control Systems Pvt. Ltd. 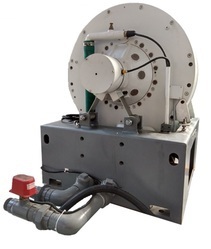 These high-performanceeddy current dynamometers are used wherever prime movers special components are developed, manufactured, tested and repaired. Example: engine endurance test, test for carburetors, injection pumps, ignition equipment & governors, testing for fuels & lubricating oils. Facilitating testing of Diesel, Gasolene, CNG engines widely used in Automotive, Marine, Industrial & Combat Engines for Production, Endurance & Overhauling application. The medium of torque transmission in Eddy Current dynamometers is a controlled magnetic field generated by a stationery coil. The developed torque in these dynamometers diminishes with reduction in speed with no torque developed at zero speed. These dynamometers are ideal for testing engines and motors in the medium to high-speed range and machines with turbo characteristics. Dynaspede Integrated Systems P Ltd.
as well us high torque load at low speed application. 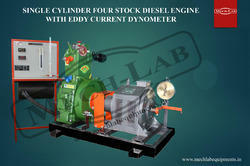 The Eddy Current Dynamometer is BI-DIRECTIONAL, DRY-GAP TYPE. In a dry gap unit, the only resistance to movement of the rotor is that of bearing friction and the small effect of windage. With zero excitation, an almost no-load condition can be achieved over the entire speed range. The Super Flow Auto Dyn 849 features large 42" diameter rolls and dual eddy-current power absorbers making for a high horsepower, high torque dyno unlike anything on the market. The Air Gap range of Eddy Current Dynamometers has been designed to be compact, robust and to allow easy maintenance. - torque is transmitted by a magnetic field without friction or wear. - simple & rugged design. - it's stationary field coils, no-slip-rings or moving contacts. - dynamically balanced rotating parts and over sized bearings to ensure long, maintenance free service. mechanical absorption unit, and electronic controller, which incorporates digital indication of speed and torque. Their are three modes of operations like constant speed, constant torque and constant current. Highly powerful fail safe safeties to protect dynamometer are incorporated. Optional computer interface is also available. SE Range of SAJ Air Gap Eddy Current Dynamometers is for testing engines from 10 kW to 720 kW capacity. The rugged design of the power absorbing system ensures a long operating life, even in the most demanding production and endurance testing environments.